I can’t be the only one to skip grocery shopping and have a ‘use up week’ before I head out of town. I am also sure I am not the only one to look into a perfectly stocked refrigerator and think “I have nothing to eat.” This recipe did begin as another of my crazy concoction meals when I had a strange combination of foods odds and ends which happened to include a container of spinach nearing the edible phase of its life. I love the playing with the versatility of a basic béchamel sauce–a fancy french technique that is simply the process of adding a liquid to a roux and making a thicker version of the liquid. It is easy and more info is found later in this post. I use this basic building block technique to make my own gravy, queso, alfredo, mac n cheese, and as a soup thickener just to name a few other uses 🙂 I don’t recall with 100% clarity how I decided upon this idea of a Spinach Dip, but I do remember scribbling a bunch of notes while I was devouring this delectable dip! I even added the phrase *skip weird freezer artichoke* clearly in reference to the freezer burned frozen artichoke hearts I had unearthed the evening this recipe created itself. As with all great recipes I recommend getting all of your intended ingredients out for use. Basic prepping makes everything else in the cooking process happen more smoothly. Anne Burrell reminds her recruits to start with their ‘Mise en Place’ during almost every episode of “Worst Cooks in America.” I dont use the fancy french words for it, but I do find their value in the kitchen when my recipes go smoothly since everything is cleaned/measured/diced/peeled/etc before I start cooking. In this case, our prep includes dicing half an onion, mincing (or garlic pressing) our garlic, and grating our cheese. It also means sorting out any bad spinach leaves and rough chopping everything else that is left. Note: the rough chop is completely optional, but when left whole, the spinach once sautéed will entangle all the stems together and make chip dipping mildly difficult. I strive to use as few dishes as possible because I hate washing dishes sans dishwasher. For this reason, I recommend starting with sautéing all of the veggies first. I start with 1 Tablespoon butter and all of the diced onion until soft. Some natural browning will occur, but crispy onion bits are not the goal. We want to cook the onion just enough for it to be soft, slightly translucent, and no longer tasting raw. Next we want to add the garlic and cook long enough to really start being able to smell the garlicky goodness (about 30 ish seconds). The spinach gets added to the onion/garlic mixture and will start wilting and reducing in volume immediately. The pictures above show the transformation of the spinach in a three minute period. You could totally skip this step if using part of a block of frozen chopped spinach. As Rachael Ray often says, it is one of the best values for your money in the grocery store. I happen to have had fresh spinach starting to go bad, and this recipe is an excellent way to use it up! Now using the same pan we can add the rest of the butter and start a roux. Simply–you need a fat (butter in this case) and flour. Whisk these two items together over heat, then add them to something else and the roux becomes a frakenfood-free thickener for all kinds of yummy foods. There are a few main types of roux, but I almost exclusively use a white roux, meaning you don’t cook the roux long enough to change color; it is also the easiest roux to make. Almost as soon as the roux is fully mixed in the pan, we want to add our milk so we can turn the roux into a béchamel sauce. By simple definition, a béchamel sauce is a white roux + milk. These steps come together pretty quickly. The above six pictures took place in a two minute period. I add the milk 1 cup at a time. The first cup needs some vigorous whisking action to combine lump free with the roux. Once you add the second cup of milk, the mixture will seem a bit soupy. No Fear! The roux just needs a few minutes time to thicken! Note: I like using 1% or 2% milk for sauce recipes. Heavier milks may cause the sauce thicken too much when paired with the roux due to the higher fat content. Once thickened, the sauce will be thick enough to coat a spoon, but not so thick that it resembles any kind of dough. If it is too thick, just add more milk until it becomes a sauce again. Now we get to add the cheese! If you were diligently working and were strong enough to avoid snacking on the grated cheeses, you will have about 1 cup each of mozzarella and parmesan cheese. I am a fan of grating my own cheese, but sometimes the sales at the grocery dictate picking the pre shredded kind (and lets be honest, you can almost never find parmesan cheese for the 20 cents/ounce I found at last weeks sale). Generally speaking, the cheese you shred yourself will melt most smoothly into the béchamel sauce. Note: we have the mix on a low heat at this point and since parmesan is a hard cheese it will need a few minutes to melt and become the smooth cheese sauce you will love. Once all the cheese is melted, you can add the spinach mixture back in. This is the point where I switch from a whisk to a spatula because the spinach would just tangle itself in the whisk. It should only take a few moments for the spinach to be fully incorporated in the cheese sauce. Taste and add salt as necessary! Note: I wait to add salt until the end because parmesan cheese tends to be a bit salty as do the tortilla chips I prefer. Commence drooling! 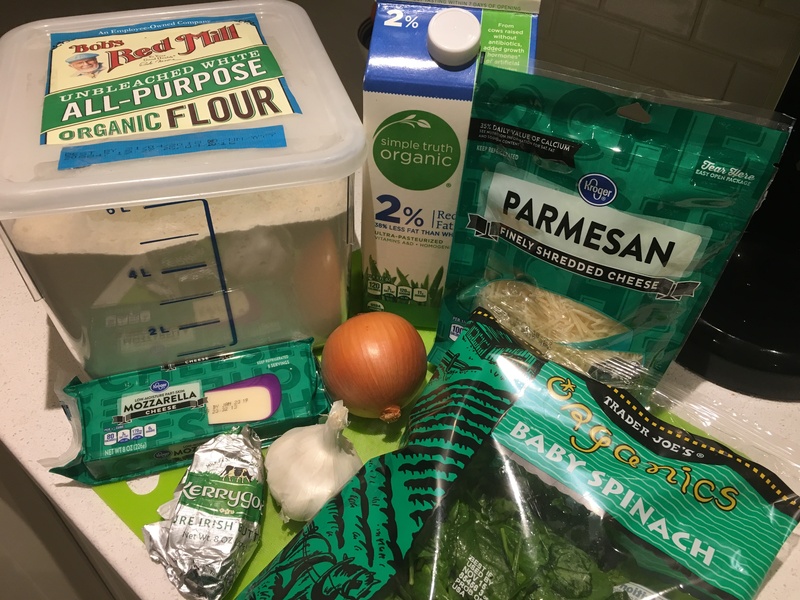 This lovely warm spinach cheese dip will go wonderfully with tortilla chips (or bagel/pita chips if those are more handy). This recipe makes approximately four cups (measured with my one-cup Pyrex containers). Extra portions reheat reasonably well by heating and stirring in 20 second intervals until desired temperature has been reached. If you are feeling fancy and want to serve it to your friends, take this a step further and add a crust of cheese and broil it until the cheese starts browning. I didn’t do that personally because I knew my cats would not be impressed. Please enjoy and let me know how this turned out for you in the comments section below! This seriously good chip dip will shine any appetizer platter, and only you will know it was made with needs-used-today spinach! Dip that chip and Enjoy!